Crossing Eternity is a new metal band started by veterans of the Romanian and Swedish music scene. Manu Savu, principal songwriter and guitarist, and vocalist Berti Barbera hail from Romania, and drummer Uffe Tillman arrives from Sweden. They deliver their debut album, The Rising World for Germany's Rockshots Records. Essentially, The Rising World is a tour-de-force of melodic heavy power metal in the best European tradition. It's also a rather large and long album with thirteen songs over one hour. But you'll find the Crossing Eternity's heavy metal to be familiar. They engage all the proper elements including guitar and vocal harmony, essential melody in the same, an effective rhythm section for power and groove, a smattering of keyboards for orchestration and accent and, of course, oodles of fiery guitar solos. While the song arrangements massage all these ingredients, two elements rose higher. First, Savu's riffs and solos have a strong presence, with the solos often following neo-classical lines. If you like powerful guitar work, you will dig this album. Second, and while he doesn't much look like a heavy metal singer, Barbera has a commanding voice, giving him a strong and versatile vocal presence. As for the songs, I'm not going to attempt to fatigue you by going through all thirteen. Yet here's a few of my favorites. One is Winter Poem, with a strong symphonic start that leads into some classic melodic power metal and an epic guitar solo. With Ghost Of A Storm and Kingdom Come, Crossing Eternity put on their hard rock hats, adding rock rhythm and groove to their power metal. The latter song is also an example of a Savu solo with some neo-classical widdling. Perhaps the heaviest and fastest song here is Journey To The End Of Dreams, certainly a true head banger. Within Dreams Fall and Angels Cry, Rainbows Hide you'll hear a touch of some Celtic fiddle lilting amidst the melodic heavy metal. 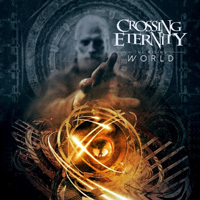 Simply said, Crossing Eternity's The Rising World is a strong debut for the band, a powerful and entertaining album of premium melodic heavy/power metal. Recommended. Simply said, Crossing Eternity's The Rising World is a strong debut for the band, a powerful and entertaining album of premium melodic heavy/power metal. Recommended.